This image, The Two Homes of SCRIPTed, depicts the foundational and the ethereal, both integral to the journal. The dome of Old College at the University of Edinburgh represents its real-world home and physical anchor. The binary code represents its content and the dynamism inherent in online publishing. The grey background represents the typical leaden skies of Scotland. A Private Law Approach to Privacy; Mandatory Law Obliged? This article contests the general assumption that Directive 95/46/EC concerning the processing of personal data and the free movement of such data requires implementation into mandatory rules of law. In this respect, several arguments are presented in order to stimulate discussion. This discussion is important because the mandatory or regulatory character of the rules laid down in Directive 95/46/EC influence the nature of rights over data in relation to the principle of freedom of contract. Moreover, it touches upon some core issues regarding European law such as the protection of our fundamental rights and freedoms; the scope of these rights, and freedoms and the correlation between them; as well as the scope of the European Union’s authority to harmonise rules concerning data protection. Furthermore, the assumption that Directive 95/46/EC requires implementation into mandatory rules of law is the main point of resistance against a private law approach to the right to data protection. If this assumption is successfully disproved, it will clear the way for a wide-ranging discussion as to whether a private law approach to the right to data protection will lead to a more effective system of privacy protection in practice. Those who value free access to law need to respond to the increasingly global nature of legal research, and the fact that most countries still do not have effective facilities for free access to law. The free access to law movement, centred around University-based Legal Information Institutes (LIIs), is assisting and encouraging the development of free access law facilities in many countries in the developing world. While doing so, it is also creating a global network of interconnected free-access legal research facilities on the Internet. This network is becoming comparable to the global legal research facilities provided by the multinational legal publishers. Can Article 5.7 of the WTO SPS Agreement be a Model for the Precautionary Principle? The aim of this paper is to suggest that the mechanism set up in Article 5.7 of the Agreement on the Application of Sanitary and Phytosanitary Measures (“SPS Agreement”) can be used as a model to implement the precautionary principle outside the jurisdiction of the WTO. Personally identifiable information (PII) can be defined as any piece of information that can, directly or indirectly and unrelated to the public interest, be used to identify a natural person. Property rights associated with PII include the right to assign the commercial value of the PII. These are relatively new rights which have emerged only as a result of the rise of commercial exploitation of PII. Currently, laws safeguard personality rights, but not necessarily property rights attaching to PII. However, drawing on philosophical thinking, particularly Hegel’s views on private property and the value of individual freedom, there is obviously an interest in protecting rights in PII. Unfortunately, existing legal tradition and mechanisms, particularly those in the USA, are inadequate and do not provide coherent mechanisms, particularly as compared to those in Europe. In future, the protection of rights in PII should be based on the value of PII. Thus, if the PII holds value relating to the subject’s personality and property interests, then both personality rights and property rights should be protected in association with the PII. Conversely, if the PII contains value relating only to the subject’s property interest, then only property rights should be granted and enforceable. Further, in this information age, every single example of PII has a potential commercial value, making it important for property rights to be defended. ‘Net Neutrality’ is a very heated and contested United States policy principle regarding access for content providers to the Internet end-user, and potential discrimination in that access where the end-user’s ISP (or another ISP) blocks that access in part or whole. The suggestion is that the problem can be resolved by either introducing greater competition, as for instance in certain Western European nations under the Telecoms Framework 2002 (as proposed for amendment 2007), or closely policing conditions for vertically integrated service, such as VOIP. This assumes that competition in the ‘local loop’ or ‘last mile’ to the end-user subscriber provides a choice of platform, and therefore rigorous telecoms competition regulation resolves the issue in Europe. However, that may not be the whole story. The question this paper aims to answer is: Are Internet Service Providers motivated to require content providers to pay for superior service via lower levels of service for the same price (e.g. blocking or “throttling” content) or higher price for higher Quality of Service? Can abusive discrimination take place even where an ISP does not have dominance? I consider market developments and policy responses in Europe and the United States, conclusions and regulatory recommendations. The Fraud Act 2006 provides us with an instrument through which we can now target emerging online criminal threats posed by identity thieves. 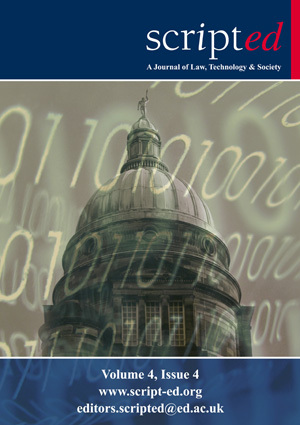 This paper argues for a nuanced approach to the debates regarding the amenability of online criminal activity to centralised regulatory oversight. Managing risks in a decentralised and distributed network environment has frequently descended into a question of how liability rules can be harnessed to promote trust and security. We argue that a deeper understanding of the governance implications of managing complex systems is an important prerequisite to coherent policymaking. The analysis advocated in the paper has a number of implications for the way we understand and conceptualise information security governance in the online environment. We identify three. First, law is a necessary but not a sufficient governance instrument in managing the emerging threats on the Internet. Second, identity theft is a social not technologically driven problem. Third, emerging networks for information sharing, the evolution of specialised technological solutions and increased end-user participation suggest an important trend in the way online threats can be conceptualised and managed. The central thesis of the paper is that Luhmann’s ideas of autopoiesis and social systems may provide us with a better understanding of governance in the online environment than what seems to be afforded by current analysis of the Fraud Act 2006. It is clear that some are more adaptive to the rate of technological progress than others. Popular culture and homes across America are rife with angst and alienation. Look for the flashing “12:00” beacons on underused DVD players, or more likely, VHS players – or maybe even Betamax. Our technology is not comfortably integrated with our lives if we fear programming a mere clock. Even among those of us who feel comfortably integrated with our technologies, it is safe to say that there is creeping alienation in the sense that the technology sometimes overwhelms the “human” in uncomfortable ways. Things move too fast, we become inundated, our senses are overwhelmed, and our face-to-face human relationships take a back seat, sometimes. Recently, two articles have appeared in SCRIPTed on ‘Copyright and Research’. One by Kevin Taylor, giving the perspective of an academic publisher (SCRIPTed 4:2), and one by Andrew Adams, from the perspective of an ‘archivangelist’ (SCRIPTed 4:3). The latter is a critique of the former. Neither article sheds much light on the role copyright actually plays in publishing research results in peer-reviewed journals. Taylor brings authors’ remuneration into the discussion, a concept quite alien to most primary research literature, where recognition and citation are the coin of the realm, and Adams seems to argue that copyright somehow impedes open access without explaining how or why that should be the case. This brief article aims to address the actual role copyright plays in the primary research literature and the appropriateness of that role. This is the first in a series of reports on the work of research centres working in SCRIPTed’s areas of interest.